1. In large nonstick skillet, heat oil over medium heat. Add mushrooms and cook 6 to 7 minutes or until tender, stirring occasionally. 2. Spray 1 side of 4 slices of bread with nonstick cooking spray. Place bread slices, sprayed side down, on work surface. 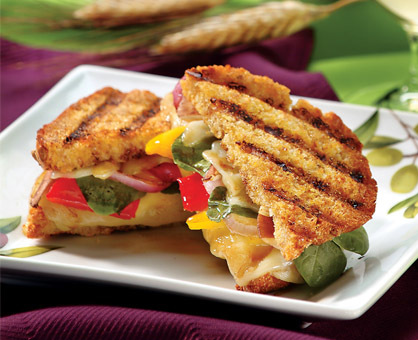 Layer each slice of bread with 1 slice cheese, mushrooms, onion, spinach and red pepper. Sprinkle with salt and black pepper. Spray 1 side of remaining 4 bread slices with cooking spray, then place, sprayed side up, over fillings. 3. Preheat grill pan over medium heat. Cook sandwiches 3 to 4 minutes per side or until bread is golden brown and cheese melts, pressing down occasionally with large spatula. Cut sandwiches diagonally in half to serve.